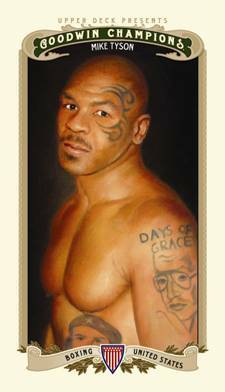 Attendees at the 2012 Industry Summit got a peak at a new partnership between boxer Mike Tyson and Upper Deck. 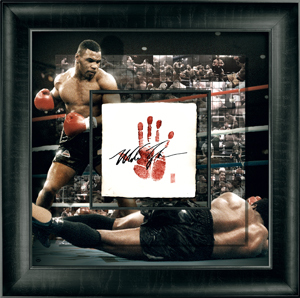 Now the card and memorabilia maker has unveiled their initial plans for new Mike Tyson autographs, cards and memorabilia. Tyson's first cards under the deal will be in the multi-sport 2012 Upper Deck Goodwin Champions. Upper Deck also announced that "Iron Mike" will appear in several other sets in the months ahead, including autographs. The deal will also see several Upper Deck Authenticated memorabilia pieces featuring the iconic boxer. Among them is a framed Tegata. The Japanese-inspired piece includes a Mike Tyson autograph, hand print and photo collage. In the past, Upper Deck has produced similar pieces featuring Michael Jordan and LeBron James. Tyson has more than 100 cards, including autographs in 2006 Topps Allen & Ginter and 2010 Ringside Boxing Round One. Mike Tyson Signed Undisputed Truth Poster+Bonus!